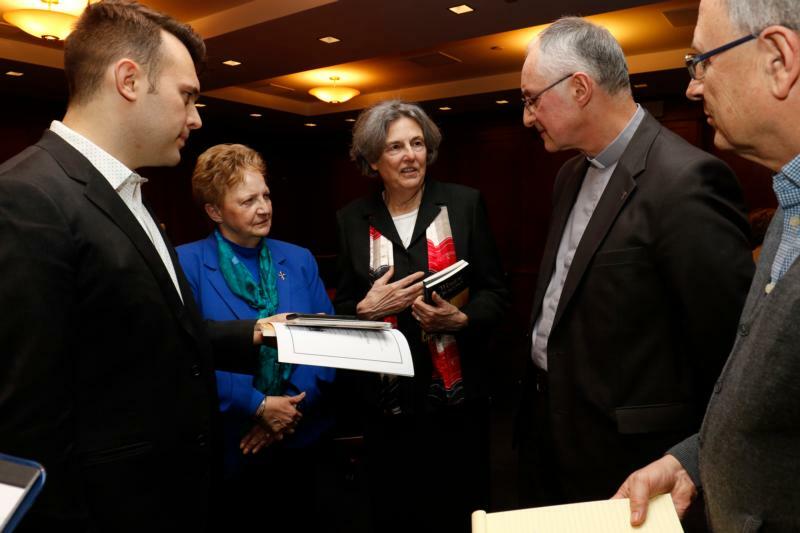 NEW YORK (CNS) — Ordaining women to the permanent diaconate now, when the church is “crying for ministry,” is a logical way to fulfill its obligation to bring the Gospel to all people, according to panelists at a Jan. 15 event at Jesuit-run Fordham University in New York. Two speakers at the event on “The Future of Women Deacons” are members of a commission on the diaconate of women established in August 2016 by Pope Francis to review the theology and history of the office of deacon. The group met over a two-year period and submitted its report to the pope in late 2018. “While there is no doubt that women deacons existed, there are differing opinions about the nature of their ordination,” Zagano said. The terms “ordained” and “blessed” were used interchangeably in reference to both deacons and priests, she said. Zagano’s research included examination of church manuscripts from the fourth to 16th centuries that are housed in the Vatican Library. She said the liturgical ceremony used by bishops to create women deacons included all the elements of sacramental ordination according to the criteria established by the Council of Trent. “Self-communicate” refers to the reception of holy Communion without the assistance of a minister. Those who are not ordained may not self-communicate. Zagano said men and women deacons performed different duties in different places. Women deacons baptized people and anointed the sick, but men deacons did not, she said. If a woman accused her husband of beating her, a woman deacon examined the bruises and “gave testimony to the bishop, who could render a judgment of nullity. To me, that’s an annulment,” she said. “Many scholars never questioned the received wisdom that women had never been ordained,” said panelist Jesuit Father Bernard Pottier, a member of the papal study commission and a permanent member of the Vatican’s International Theological Commission. Research has provided “more and more evidence that it was so” and as more scholars and laypeople learn about the new findings, the argument that women were never ordained “is not sustainable anymore,” he said. “It’s a slow reflection together to get evidence that it’s possible,” Father Pottier said. The diaconate as a permanent state first lost ground to the transitional diaconate in the Western church, whose “canonists wanted to define sacraments with clear words” and “wanted a simple process” to priesthood, he said. “This is not a step toward priesthood, but a permanent rite restored by the Second Vatican Council. It’s a vocation, a calling” that is consistent with the Christian mission to witness Christ to all people, Sister Ciangio said. “This is not about power. It’s about ministry,” Zagano said. “We were six men and six women working in the office of the Congregation for the Doctrine of the Faith and the building didn’t burn down. This is historic,” she quipped. The symposium was organized by the Fordham Center on Religion and Culture and moderated by Basilian Father Thomas Rosica, president of Salt and Light Media in Toronto, Canada.